By Glyn Dowden The annual St. David’s Day Gathering of the Welsh Society of Western New England (WSWNE) was held on Saturday, March 1, 2014 at the Nutmeg restaurant in East Windsor, CT.
From Connecticut, Western Massachusetts and even as far away as New Hampshire there was a gathering of 45 Welsh, or partly Welsh, or vaguely Welsh souls in attendance. With an energetic clink of a glass WSWNE president Susan Sit kicked things off with p'nawn da. We then watched a brief video of Carwyn Jones the First Minister of Wales. In his St David's Day message Carwyn, who has made something of a reputation for himself with the English by always claiming, quite rightly some would say, that London is to blame for all that is untoward in Wales, wished everyone a happy St David's Day. "Dydd Gwyl Dewi hapus i bawb." Jason Ellsworth then delivered a prayer and paraphrased part of a poem by Brian Harris; to be Welsh is to be born privileged with music in your heart and poetry in your soul. This set the right mood for the afternoon so that we could all settle down to eat and drink. Needless to say, even though Saint David with a white dove on his shoulder, thought that monks should pull the ploughs without draught animals, drink only water and eat only bread with salt and herbs, and he taught that his followers should refrain from eating meat and drinking beer, we ignored all that and a good time. Some eating fish, some meat or chicken and others the pasta. By the time we had finished the last main course, ice cream and coffee we had also enjoyed sharing our history, stories and pleasantries with each other across the table. Most conversations revolved around Welsh heritage, but because of the melting pot of America we had a scattering of Welshness from all different peoples with connections to countries such as Italy, Ireland, England, Germany etc. On our table we had Dewi Joslin Snr., his Italian wife Diane and Dewi Joslin Jnr. who had travelled all the way from New Hampshire to celebrate with us. Dewi's mother had been born and lived in Conwy, Wales. Also Valerie, a chapter president of the DAR and whose family were Mormons in Wales. She told us about her experience as a member of "The Society of Descendants of Lady Godiva" (who could have believed there was one of these in the US). Such were the many convivial conversations that took place. Susan quickly dispensed with Annual Board matters with a minor modification to our by laws and the voting in of the same Board members. Bob Bolgard WSWNE treasurer provided a summary of the finances and assured us that were we were solvent. Sherry Williams our vice president thanked those of us who attended the lunch and expressed her delight at being able to celebrate Saint Davids day. Sherry described the Welsh Dragon while holding up a steel copy of the Y Ddraig Goch. Apparently the red dragon represents a fierce warrior. The story being; the red dragon overcame the white dragon which was the Saxon invader. Our speakers on St. David's Day. Magdalen Dowden told us all about the Welsh National Anthem "Hen Wlad Fy Nhadau" which was composed by Evan James in 1856 in Pontypridd. Apparently ever since its introduction the English have protested that "God Save The Queen" is the national anthem of the UK and all four of its constituent countries. The Welsh of course pay no attention to this and "Hen Wlad Fy Nhadau" can be heard at all major pubic events in Wales or where ever the welsh are representing their country. 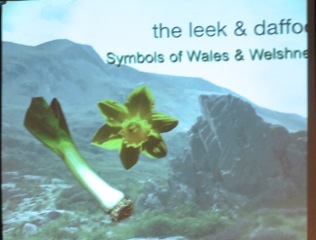 Trey McCain revealed how the leek and daffodil became national emblems. The leak being the first emblem. According to folklore it could protect you from lightning and was worn in battle since it could protect you from harm (and who's to say it didn't). Anyway the battle of Crecy where Welsh bowmen came to the fore was fought in a leak field and according to Shakespeare Henry V wore, or had a leak. The daffodil "Cennin Pedr" or Peter's Leak on the other hand has a shorter history. This national emblem was, for who knows what reason, vigorously promoted by Lloyd George. 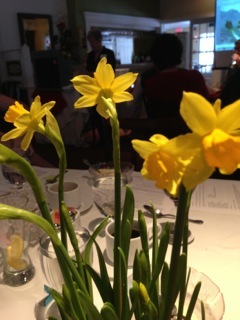 As an aside it turns out that daffodils produce Galan amine compound which is used to slow the effects of Alzheimer's. We always knew the Welsh were smarter than the average. Shirley Kiefer entertained us with two lovely stories about mythic Salmon. The first with an Irish setting and the other in Wales. According to legend and Shirley there is a good chance that salmon can change an Irishman into somebody like James Bond and a Welshman into a Bard. Sherry then mentioned the upcoming auction that we were planning and Magdalen instantly offered up her husband but fortunately there were no takers. We closed with the Welsh National Anthem all singing in the Welsh language and looked forward to next time when we would celebrate the culture and memories of Wales.